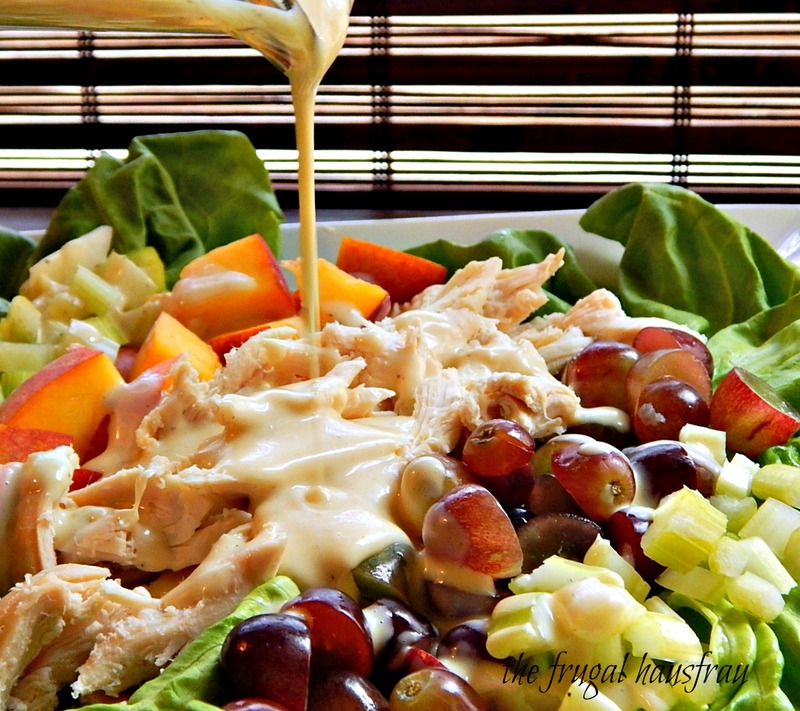 And I love it in this Fruited Chicken Salad with Honey Dijon. I love it. Yes, yes, yes I do. And I do know other people that like it, too; over the years I’ve made this for lots of friends. So this is an oldie but a goodie. And I think it will never go out of style. But then I think a lot of the things I wear won’t either! A couple friends had to talk to me about white socks awhile back…thanks, Jennifer & Kyle! Use whatever seasonal fruit you’d like, along with any good green lettuce. Mix it together if you want. I just took the pretentious route and laid it out in rows. Just coz I think it looks cooler! But doesn’t putting a few simple items in a salad just kind of elevate the whole works? I mean a few grapes, a nectarine and a little celery never tasted so good! When shopping for fruits and vegetables, it doesn’t hurt to pull out the sales flyer and see what’s on special and design your menu that week around it – especially in the summer when there are so many gorgeous things to choose from and a new sale each week. Buy enough of what’s on sale to last through the early parts of the next week, too. Note: Time is with cooked chicken. Use any leftover or rotisserie or poach a breast or two for about 12 minutes, or until done. Combine lettuce, celery, grapes, nectarines and chicken in a bowl, or lay out the lettuce and arrange the ingredients on top. Mix together the dressing ingredients: mayonnaise, lemon juice, honey, and mustard. Dress as desired and pass any remaining dressing. Top with almonds and chives. This entry was posted in Click here for Bargain Meals, Click here for Fabulous Food Posts and tagged Almonds, Bargain Meal of the Week, bibb lettuce, Chicken, Chicken Breast, Fruit, Grapes, Lettuce, Nectarines, Nuts and Seeds, peaches, Salad, Salad Dressings. Bookmark the permalink. Hi, and thanks! This is one of my favorite summer salads! I like honey dijon, the salad is fabulous!! Mmmmmm! That looks sooooooo good! I love a good salad with chicken and fruit and homemade dressing goodness! I love a good hearty salad loaded with various ingredients… this is perfect!!! I LOVE this combo! Anything Dijon- yummmmm! Looks so refreshing. Lovely presentation and pictures. Oh my. That looks so good.